Forestry allows editors and guests to manage their website in a variety of different ways. This enables developers to build powerful, static sites while empowering editors to take full control over their content. The most basic type of content in Forestry is a page. Pages are any ungrouped content in your static site, such as an about page or contact page. They appear in the Pages collection under Content in the sidebar. 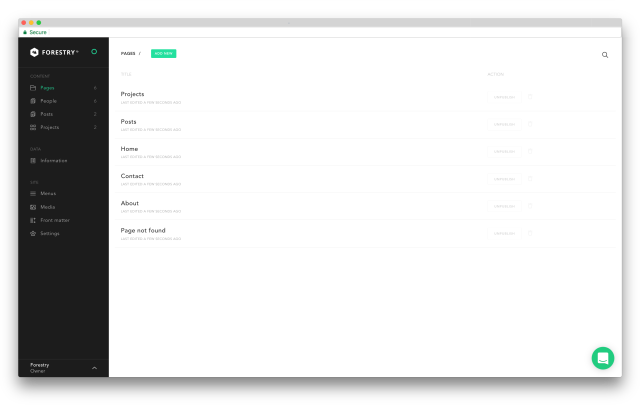 In Hugo, pages are any content files stored inside of the root of the content/ folder. In Jekyll, these are any content files that are not part of a Jekyll collection. Collections are grouped content in your static site. These are feeds or hierarchies of content, such as blog posts or landing pages. They appear under Content in the sidebar. In Hugo, these are any folders inside of the content/ folder, called sections. In Jekyll, these are content files that are part of a Jekyll collection. Data files are special content files that aren’t rendered as HTML pages in your built site. They are used for adding rich metadata site-wide, like authors or company information. They appear under Data in the sidebar. Learn more about using data files with Hugo and Jekyll in their documentation sites. Pages, collections, and data files can all be searched by the title field and by filename.